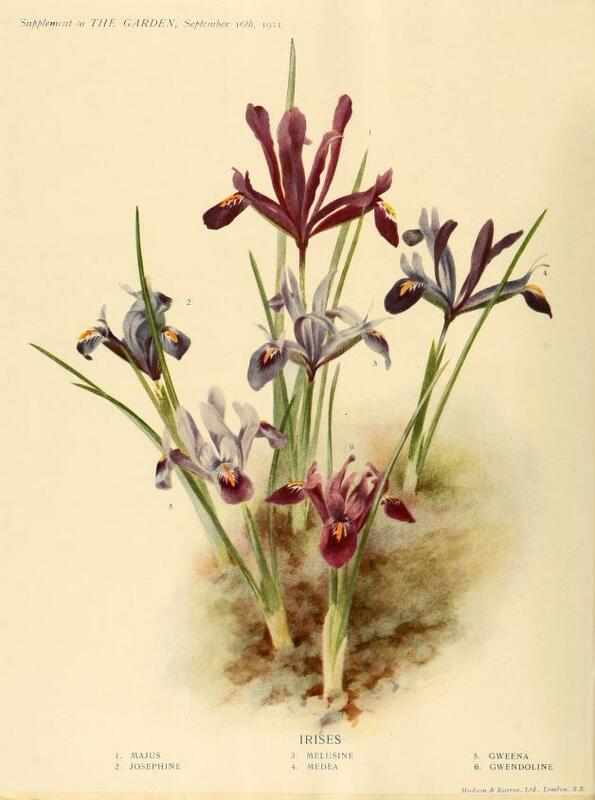 Section Monolepis which includes the species Iris kolpakowskiana , Iris winkleri , and Iris pskemensis. Section Micropogon which includes the species Iris danfordiae . The new species Iris zagrica would be in the Section Hermodactyloides along with Iris tuberosa. The members of this well-marked section are characterised by the netted coat of the bulbs, by the short, one-flowered stem, and by the peculiar character of the leaves. These are either four-ribbed (I. reticulata, Plate XLV) or eight-ribbed (I. Bakeriana, Plate XLV). Difficulties arise when we endeavour to separate those plants, which have four-ribbed leaves, and to give them specific names, for there is no doubt that the Caucasus, Asia Minor, and Syria contain a vast number of local forms. On the whole, I am inclined to think that these fall into two main natural classes, which differ in the character of the bulb or rather in its mode of increase. When a cluster of ripe bulbs of I. reticulate is lifted, it will be found to consist of a relatively small number of bulbs, about half of which are of flowering size, and the rest of such a size that a year's, or at most two years' growth, will bring them to flowering strength. On the other hand, bulbs of I. hz'strio will be found surrounded at the base by a large number, often as many as 20 or 30, of minute bulblets not much bigger than grains of wheat, which take three or four years to arrive at flowering size. The first of these two classes appears to be confined to the Caucasus region, and the latter includes the Asia Minor and Syrian forms. Unfortunately, herbarium specimens are of little assistance in deciding to which of the two classes a plant belongs, for the reason that these specimens are mostly collected when the plant is actually in flower. At that time the substance of the old bulb has been mostly absorbed in the effort of flowering, and the bulbs for the next year are hardly discernible within the old outer netted coat. The number of specific names that are bestowed within the limits of these two classes must depend on the view we take of what constitutes a species. The typical blue violet, I. reticulate ( Plate XL V), is probably the rarest form in its native habitat, where red purple forms, to which the name Krelagei is usually applied, are far more common. Moreover, in any batch of seedlings from the blue type, red purple forms predominate', and in view of this it is certainly curious that some red purple forms are always in flower at least a fortnight, if not a month, earlier than the typical I. reticulate. Why the change in colour should retard the flowering is not apparent, but I have never known the type to flower until some weeks later than the first Krelagei. The polymorphous character of I. hirtrio was well illustrated by a number of bulbs that I received some years ago from Marash in Asia Minor. They all agreed in having the divergent standards, which I take to be typical of I. histrio (cf. Plate XLVI), but differed to an extraordinary extent in colour and marking. Some were much blotched, others were hardly blotched at all but merely veined, some were pale blue, others dark, and one was the remarkable form that I have named atropurpurea (see Plate XLVI, Fig. 3). In cultivation, the reticulata Irises are capricious. In some situations, they become diseased and die out, with the exception perhaps of one or two small bulbs, which persist and grow into flowering clumps a few years later. This disease appears to be most easily held in check when the bulbs are lifted every other year. This frequent lifting may be troublesome, but it has the additional advantage that the flowers are displayed to much better advantage when the shape of each stands out distinct and is not merged in a mere mass of brilliant colour. My own practice has been to lift the bulbs soon after the leaves have died completely away, and to treat them for disease as suggested at p. 16. They are then dried in the shade and packed away in dry sand until September or early October, the earlier date for replanting being on the whole preferable. As regards soil, the chief recommendation is to ensure efficient drainage and the presence of some lime. If the natural soil is very poor sand, it is well to enrich it with a heavy dressing of well decayed leaves and crumbled clay. The addition of old manure produces very large bulbs, but tends, I think, to introduce disease. All the forms of I. reticulata are liable to be fertilised by insects, though the capsules thus obtained are rarely as full of seeds as those that result from the artificial pollination of all the three stigmas of the flowers. Seeds may be sown in the open about ½ an inch deep in fairly rich light soil, and the bulbs may either be left to flower on the spot, or perhaps preferably be lifted after two years and replanted in rows a few inches apart. They should flower in their third or fourth year. A curious point will be noticed in the development of the flowers of these Irises. The growth of the buds inside the spathes is slow but, once the spathe bursts open and reveals the bud, growth for a short time is extraordinarily rapid, and I have actually measured it as one inch in seven hours and two and a half inches within twenty-four hours. An apology must be made for the inartistic means adopted in order to economise space in the illustrations of these Irises. It was impossible to include a complete drawing of each plant, and it is hoped that the habit of growth is sufficiently indicated by the drawing of I. reticulata, and by the descriptions given in the text of the other species.